I was planning on making ice cream cupcakes soon, but my daughter said she preferred ice cream cookies. I decided to make the cookies first, and the cupcakes another day. I used an M&M’s cookie recipe in a 12-year-old M&M’s cookbook that I got for free way back when (although I realize the same recipe is also available on the back of the M&M’s Mini Baking Bits bag). After the cookies cooled down, I put the cookies in the freezer and took out the vanilla ice cream to soften it. I thought that putting the cookies in the freezer beforehand to harden them up would make them easier to work with, so they wouldn’t crumble. After the ice cream was soft enough to spread, I put a couple spoonfuls on one cookie and smooshed another cookie on top, using a knife to scrape off excess ice cream around the edges. When that was done, I froze the ice cream sandwich cookies again to harden up the ice cream (and of course, put the rest of the ice cream back in the freezer!). Once they were completely frozen, I wrapped them individually in saran wrap and stuck them in a Ziploc freezer bag. They’re pretty good, but not entirely what I was expecting. I wanted a chewier cookie, but these ended up a little crunchy. I wonder if chilling the dough would have helped? I made two different sizes; bigger ones for the adults, and smaller ones for the kids! I might try these again sometime, but with a chocolate chip cookie. 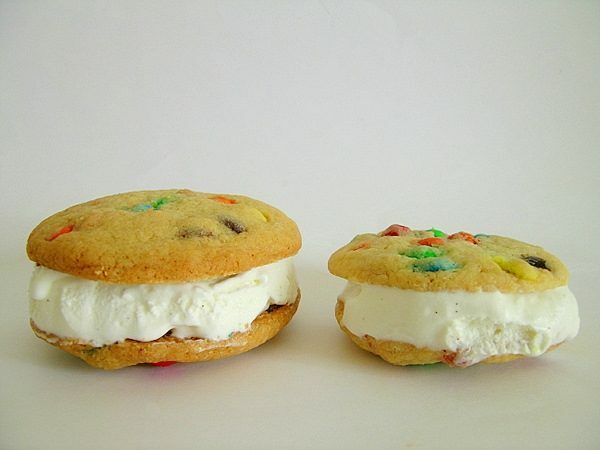 M&M cookies are delicious when used for ice cream sandwiches! In a large bowl, cream butter and sugars until light and fluffy; beat in egg and vanilla. In medium bowl, combine flour, baking soda and salt; blend into creamed mixture. Stir in M&M’s. 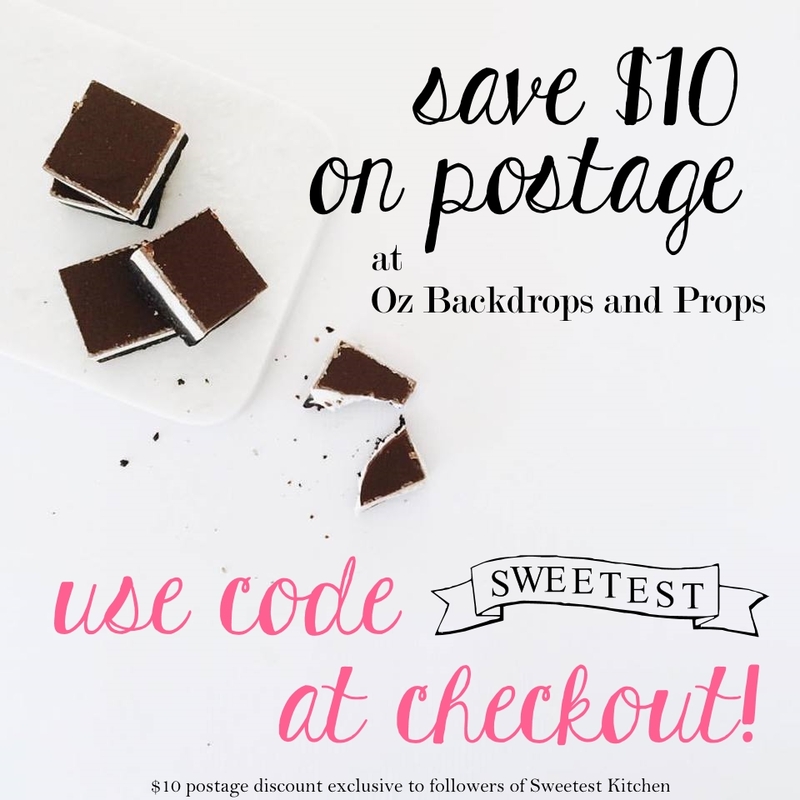 Drop by heaping tablespoonfuls about 2 inches apart on ungreased cookie sheet. Bake 10-13 minutes or until edges are lightly browned and centers are still soft. Do not overbake. Cool 1 minute on cookie sheets; cool completely on wire racks. You daughter is very lucky. These look great. I have never tried ice cream sandwiches – although used to love this place that made them fresh (you pick cookie and ice cream) when I went to UCLA and could eat dairy). Thanks. These sound delicious, my childrenwould love them, I mean lLOVE and they are so pretty, too!! So pretty! 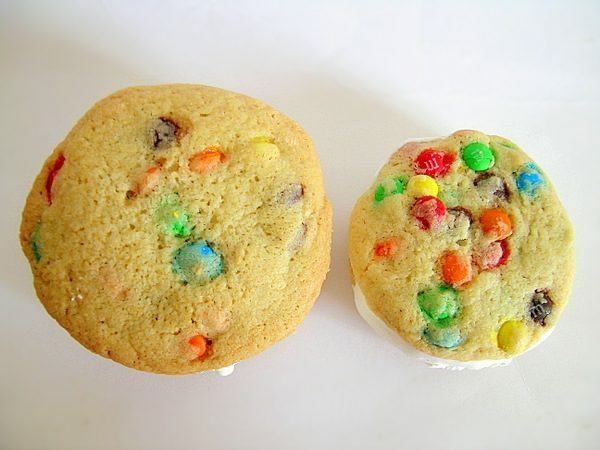 I love M&M cookies, especially when you throw some ice cream into the mix. Thanks for sharing!